We began our business when a friend wanted to learn to spin. We'd heard about Greentree Ranch in Loveland, Colorado, where they raised sheep and taught spinning. One day we hopped in our van with friends and dogs and drove up to the ranch. Not only did we get a quick lesson in the art of the drop spindle, we also came home with a commission to make 200 of them. When we delivered the spindles to the Greens they were delighted, especially with the little green tree we had hand painted on each one. Louise Green, who was just starting to weave, suggested we make a simple loom. "What's a loom?" we asked. Our first model was a portable tapestry loom, a version of which we still make today. 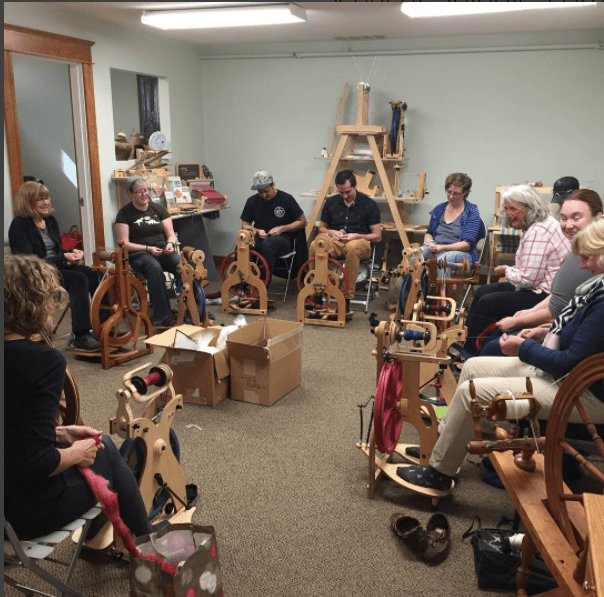 To spread the word about weaving (and to get dates! ), we taught classes at the Boulder Free School, and soon opened a retail shop to serve our students. In the beginning, we designed simple looms and accessories at one of the university's woodworking shops. Our early manufacturing was done with the help of a commune and a retired woodworker in Loveland. Later, we set up a shop in our garage. From there we moved through a series of "real" factory spaces with honest-to-goodness power equipment. In 1985 we built a factory in Boulder. Today, we build our looms in a 35,000 square foot factory with 50 employees, and are one of the world's leading makers of handweaving looms and spinning wheels. We count on the expertise and enthusiasm of our dealers around the world. Your local dealer is a tremendous resource for information on Schacht products and their use.